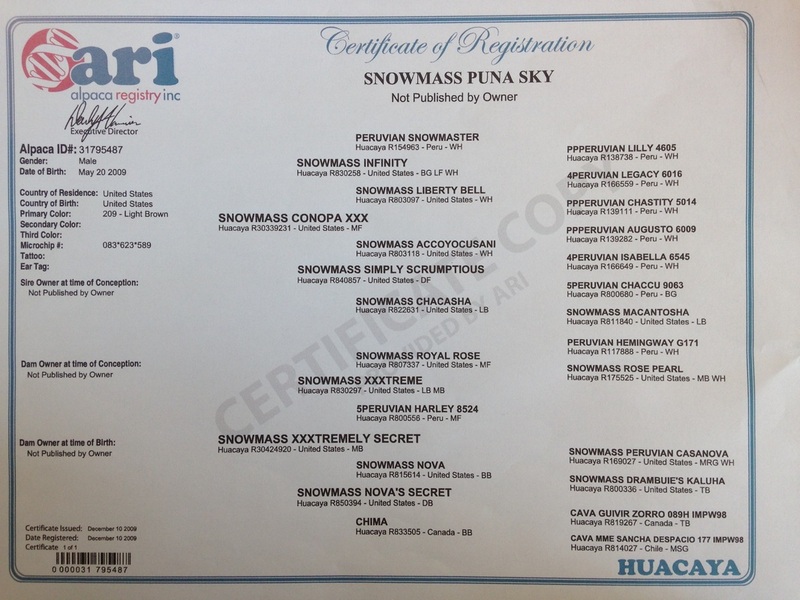 Puna Sky epitomises those qualities that have made the Snowmass name synonymous with success. 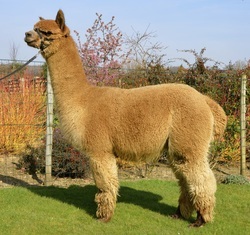 This relatively young male is of an exemplary phenotype, heavy boned and beautifully balanced he is carrying a fine and dense fleece that is uniform in fineness both within the staple and across the body. With his astonishing staple length he has a heavy cutting fleece with a wonderfully soft handle so much needed by the textile manufacturers. With a very distinctive architecture and excellent brightness this fleece cannot but succeed to impress. Add to this a pedigree that includes many of the most famous names within the American pedigree register, and non other than the pre-potent Snowmass Conopa as sire, and you can perhaps understand why we are so excited at the prospect of introducing his colour genetics into our breeding programme. Just look at the depth of pedigree on the next page to understand our confidence in him. We are thrilled with our first crop of progeny from 2014, the majority of them coloured, and even more thrilled that he had a grey son out of a grey female who was placed 3rd at the 2015 BAS National Show.